Family owned and operated, former CBDC Cabot client Ever After Bridal Boutique is a full-service chic boutique specialising in exclusive designer labels and environmentally and ethically friendly accessories. They proudly stock Canadian and North American designers and promote local, high-quality products. Co-owners Cyndi Corbett Dawe, Connie Rideout and Julie Morin are all mothers, so when they set out to create a business four years ago, they knew it had to be one in which they shared the workload and responsibilities equally. 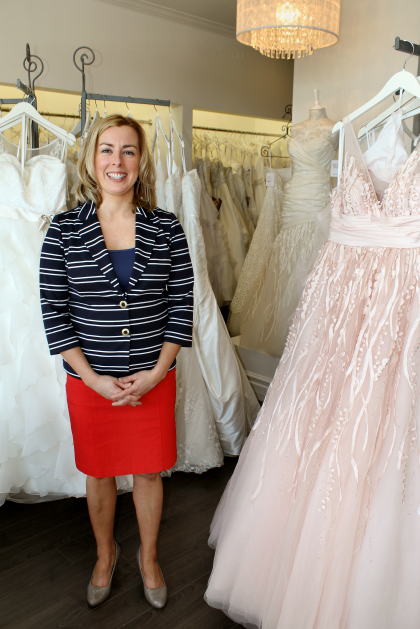 The two full-time and two part-time staff at Ever After Bridal Boutique are also mothers – the owners pride themselves on mentoring mothers returning to work and they partner with mom-owned businesses when they can. With “individualised and unforgettable customer service,” the staff members at Ever After Bridal Boutique seek to cater to their clients’ every need. “Definitely the smiles on the faces of the brides make it all worthwhile. We are so proud and happy to help them feel good about themselves on their special day,” said Cyndi. A CBDC start-up loan and business plan support was where it all began. With the encouragement of CBDC Cabot staff and additional CBDC loans and business workshops, Ever After Bridal Boutique has seen sales double pretty much every year of operation. Thus far in 2015, they were happy to pay back their CBDC loans in the hope that it would now go to someone else who could grow their new business. Growth is something the owners of Ever After Bridal Boutique are getting used to – recently they purchased a 4,000 sq. ft. building in Mt. Pearl where, starting in September 2015, they will continue to serve existing clients and welcome new ones.